For water-blasting we recommend thermoplastic high-pressure hoses reinforced with spiral zed high-tensile steel. 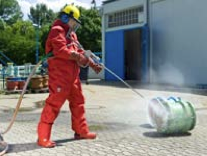 We have many years of hand-on experience in the water-blasting sector, which we’ve used to develop & produce hose assemblies that are used for concrete removal, sewer cleaning, water jet cutting, pipe cleaning, heat exchanger tube cleaning, and surface preparation, as well as the removal of deposits of all kinds. For this industry, we provide hoses with 2-, 4-, 6- und 8 layers tested at working pressure ratings of up to 3200 bar.